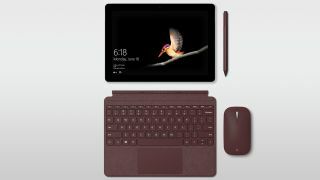 Microsoft has begun selling a new configuration of its divisive Surface Go tablet that was, until now, exclusive to Costco in the US. The model features the enhanced storage of the high-end model, but the memory of the entry-level device. While it's available on the Microsoft Store it's still only on sale in the US for now, and we don't yet know if Microsoft plans to bring this model to other markets. Microsoft wants $499 for this version of the tablet, which sits between the entry-level configuration of 4GB of memory and a 64GB eMMC solid-state drive (SSD) and the highest-end model, with double the amount of both. That price gets you a slightly more palatable combination of a just-fine 4GB of memory, and a much better 128GB SSD compared to the entry-level model. Plus, it’s important to note that the 64GB eMMC SSD used in the Surface Go is markedly slower than the standard-format 128GB SSD. So, you’re getting a slightly faster version that’s also more capacious, for a little less. Based on the relative pricing of the other models we'd expect this model to be priced at around £470 or AU$750 if it does arrive in the UK and Australia. However, if you're looking at this configuration you’re then just $50 (in the US) away from the most powerful and capable version of the Surface Go – so at that point you may be better off saving up for another month or two for the best version of the tablet. And, of course, neither of the essential accessories are included, so tack at least another $99 (£99, AU$149) on top of that for the true price with a Type Cover keyboard, and another $99 (£99, AU$139) if you want to add the Surface Pen. So while this new configuration seems exciting at first glance, you'll want to think hard before you click that ‘buy’ button.